As you probably know, I’ve been on a mission to get my kitchen back in order. The first step in this process was to fix the trim around the window. You may remember that there used to be a bench here. The trim was removed when the bench was installed. So when I took out the bench, I was left with an ugly looking window. The goal is to get this window replaced within the next couple months. I’m not sure why a piece of wood covers the bottom of the window or why the window doesn’t open, but if things go according to plan, it will soon be gone. In the meantime, I wanted to make this area a bit more presentable by fixing the trim. (Because of how the window is installed, I shouldn’t need to remove this new molding when the new window goes in.) Anyway, I picked up some trim boards, cut them to size, nailed them in place, patched holes, sanded, and painted. Molding complete. 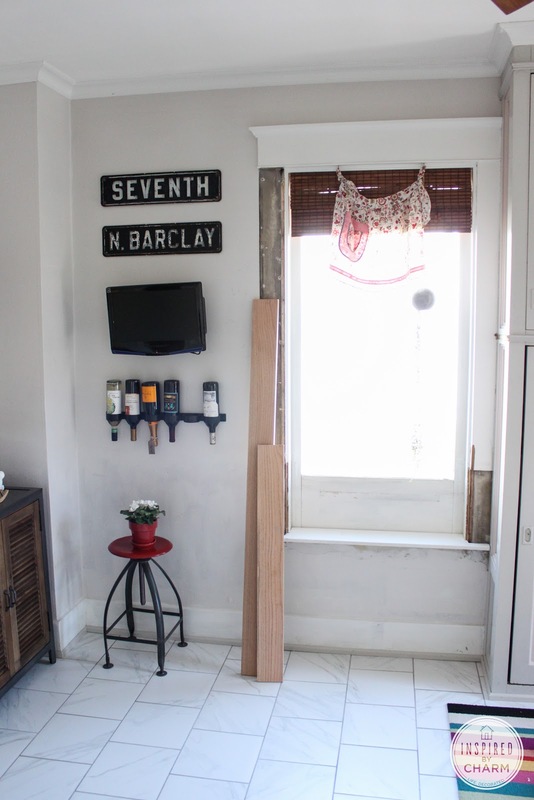 The difficult part was that because my house is almost 100 years old, finding replacement molding is nearly impossible. So the process can be a bit time consuming. Plus, in all honesty, because hammers and I don’t get along, this project took even longer than it should have. I’m not as handy as I pretend to be. I blame it on having zero patience. Once all that was complete, the fun part could begin – shopping for some colorful and functional accessories. And I knew exactly where to go. Target! You know I’m totally in love with their Threshold line. 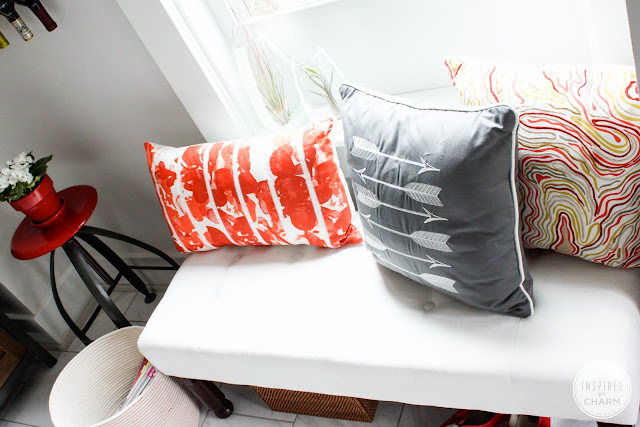 I’ve had my eye on a few pillows from the collection for some time and knew they would be perfect. I was also on the hunt for a bench. I needed a place where I could take my shoes off or enjoy a cup of coffee in the morning. So after some fun shopping, I came home with a completed look. The velvet white bench is not from the Threshold collection, but it’s perfection! I will admit I’m a little nervous about having white fabric in the kitchen. We’ll see how that goes. My favorite things are my new pillows though. The marble-inspired one is probably my absolute favorite. I’m pretty much obsessed with the pattern. 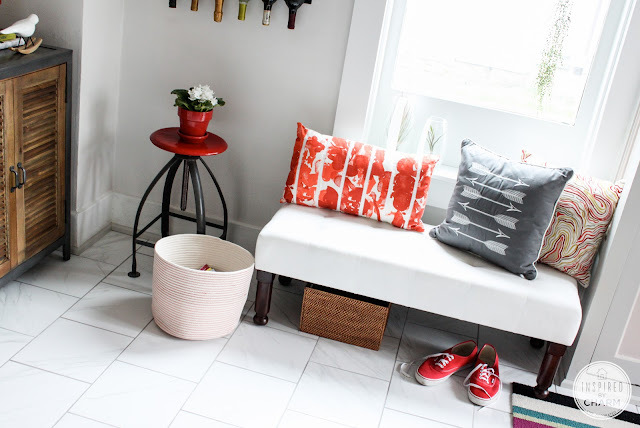 The pillows are the perfect color collection for this season and my kitchen. I think they make the space look really inviting and welcoming and I’m loving it. I also further indulged my air plant obsession. When I was visiting my brother and his family recently, I found two new plants. Needing a place to put these two lovelies, I found (Confession: My mom found them.) 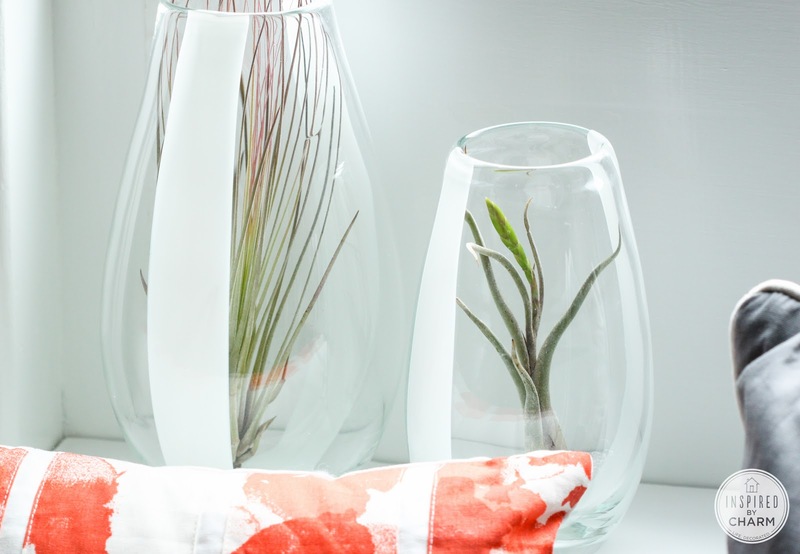 these tall glass vases with fun white stripes. Talk about perfect. What do you think of my updates? 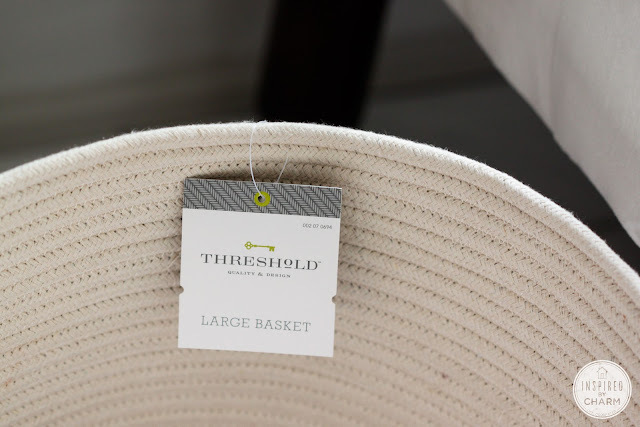 Have you found any fabulous Threshold pieces at Target? A big thanks to the awesome folks at Target for supplying me with these beautiful Threshold products at no cost in exchange for my review. Please note that the opinions, thoughts and ideas listed above are my own. I really do love and recommend these products. Love Target, love Threshold, love it all. 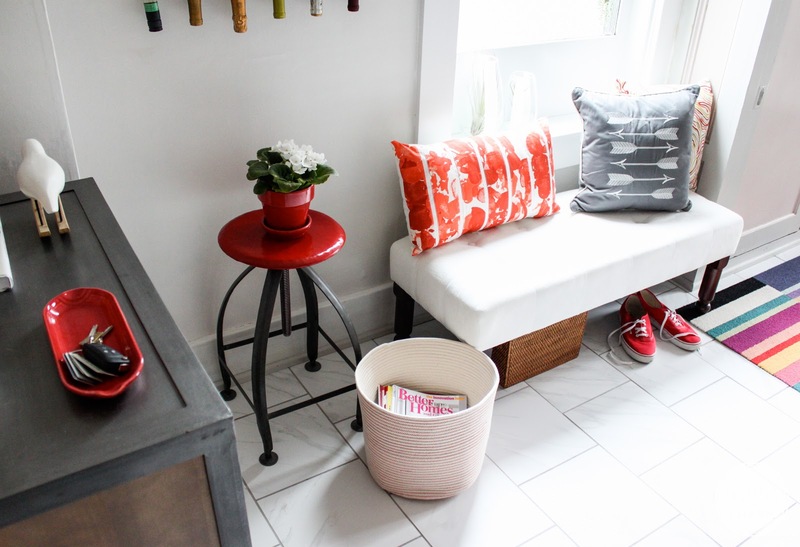 I love the red stool/plant stand you’re using there, and I also love the picture where your cow chair is peeking in from the dining room. It really is part of a continuous, consistent design–it’s not like, “Oh, and there’s Michael’s dining room and his new dining room chairs.” Just looks like one space. Love. Oh Maggie, you got it! Thank you SO much for all the LOVE! 🙂 I can’t tell you how much I appreciate all you do and give. Charming as always. Nice use of colors and definitely great photography. Thanks for sharing! Since your window is allready finished it dosn’t matter too much but there is a hardware store in Brockway that carries trim for old homes. We are in the middle or remodeling a 100+ year old home and searched quite a while to find period correct trim. The window and bench are cute! Love all that color! GRRR! It is really coming together and looks just beautiful. I envy your ability to combine items and make them look cohesive. If you are worried about the bench, you might try spraying some ScotchGuard on it. Also, you have have mentioned it on another post, but can you tell me where you got your stool? I’m looking for two of those same type of stools for the new bar area I’m making behind my stove peninsula. Yes – great idea! I thought about ScotchGuard, but was nervous about it making the fabric yellow or something. I guess I could test and area? The stool is from a company I used to order from for my shop – Kalalou. I don’t believe you can order from them without being a retailer. Thank you so much Bev! I was actually just down in your neck of the woods this past weekend. Hope life is well! This is fabulous–I’m not very familiar with that line at Target, will have to look closer! I try not to look at the home decor section because I get too tempted! I am bummed you weren’t able to make it to SNAP, I was looking forward to hearing from you…going to Haven? I’ll be a speaker there! Looking great!! I am especially in love with the frames from the Threshold collection! I have bought several of them for gifts recently…now I just need to grab a few for myself! Love how your kitchen space is turning out! 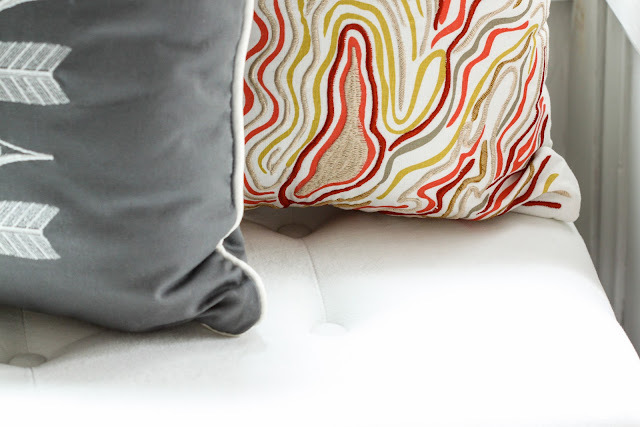 Love the beautiful colorful pillows from the Threshold collection! I know I’m way behind the ball on this post. 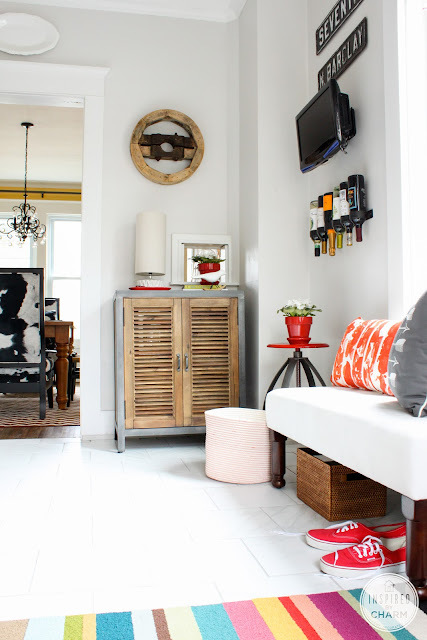 Where did you get that metal storage cabinet with the wooden shutter doors? I think I am obsessed with it and MUST have one. Thanks also for the great recipes. I don’t know how I had found ur blog but the corn dip and chorizo cheese dip have been such winners and so easy to throw together! 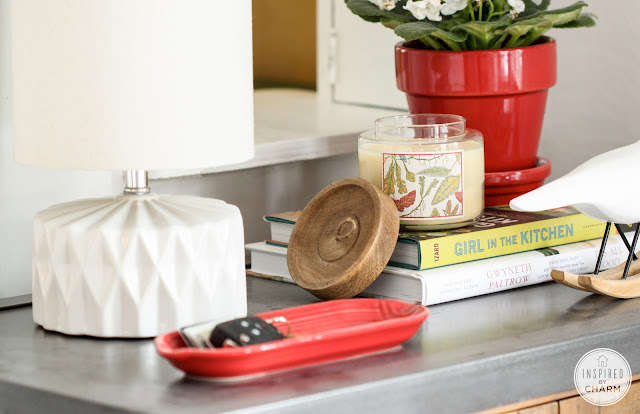 I stumbled upon your blog through Rue magazine – I am loving the ceramic lamp in your 2nd last photo, may I ask where you got it from? Thanks in advance! Yay! Thanks for stopping by! I love Rue. I found them (I have two) at HomeGoods about a year ago. I know that’s not very helpful, but that where they are from. Where did you get the stool with the plant on it? I love the red seat. I have only been able to find with a wood seat! 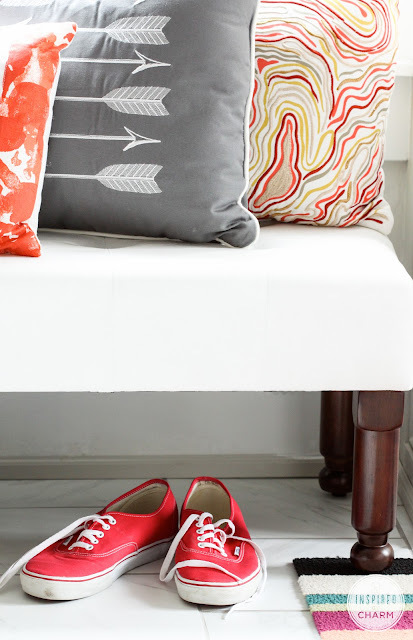 Michael, the pillows are great but my favorite thing about this post is the fact that red sneakers are an accessory. Love. That was a last minute addition to the shoot! So glad you like it. It’s such a fun pillow! Great choice! Just discovered your blog! LOVE your style!!! Can we be bff’s??? Okay – so maybe that’s a little strange. No seriously! 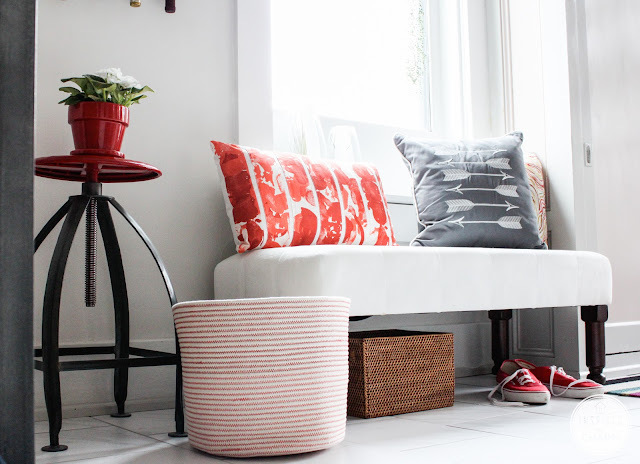 Great pillow combo and love the mix of textures and pops of color. I need you to come help at my house! Love how you have a modern cottage vibe going. Okay – I’m headed off to snoop around your site some more. Awww! You are so sweet Carrie. Thanks for all the love! These kinds of message make my day! What color paint is in the kitchen? I love it!!!!!! What is the name of the taller two air plants? I don’t have any yet, but like it reminds me of pine needles. Thanks. I actually don’t know. So sorry! I picked them up at a local store and never knew. I love how you combine colors. 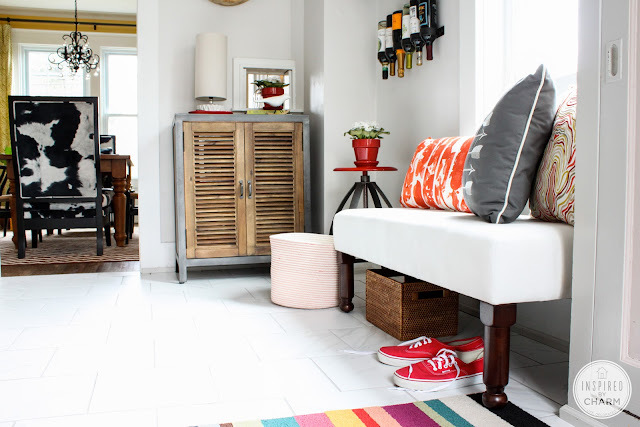 You pick things out that look underwhelming in the store but look great in your home. You would be awesome to go shopping with!